When I receive new polishes in the mail, the first thing I do with them is swatch them onto my swatch sticks. I have a very impressive collection of swatch sticks, all sorted by colour, looped onto rings and stored in plastic box. When I swatched this collection from Dance Legend, I thought it was very pretty. 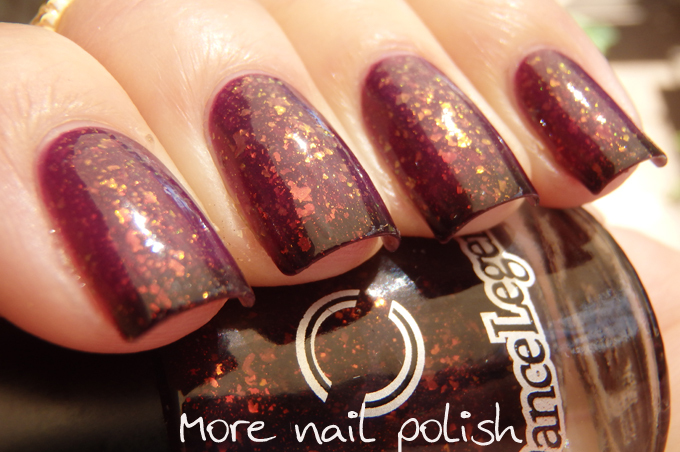 A collection of very dark, blackened jelly shades full of colour shifting shimmer and flakies. Imagine my surprise when I put them on and saw them changing colour. You see these are also thermals, which I didn't know because the bottle writing is in Russian, and I hadn't previously see swatches. 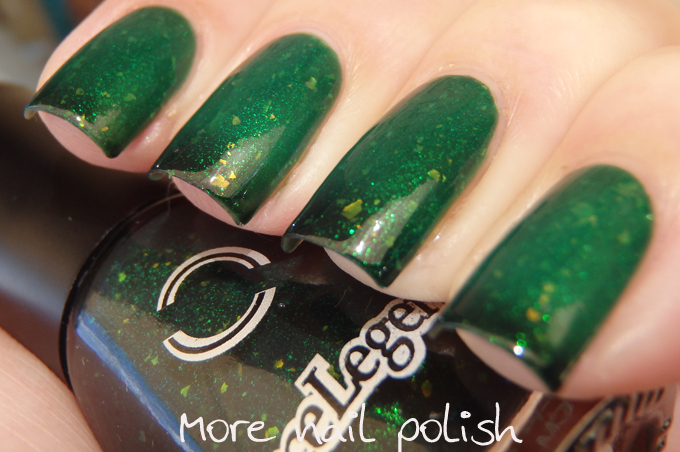 There are three polishes in the Dance Legend Mortal Kombat collection representing three of the characters from the series. Rain - the warm version is a purple leaning plum, it can definitely look quite purple depending on the lighting. There are lots of color shifting flakies packed in, these ones going from yellow to orange to green at extreme angles. There is also a fine shimmer that actually shifts from red to green too. 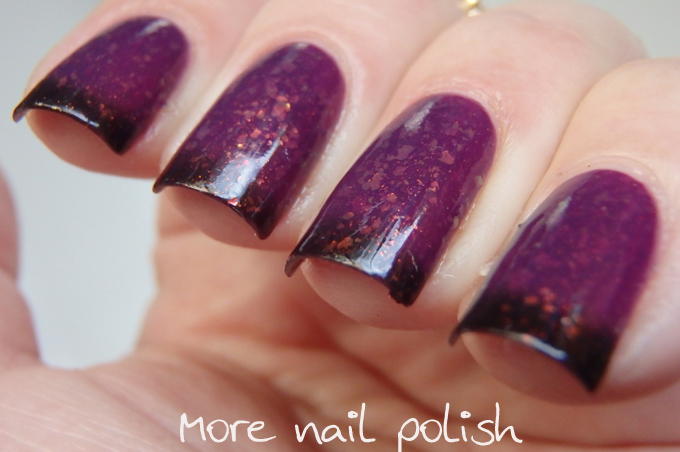 The dark shade is a deep maroon, but the jelly base still allows the flakies to show through. Most of the time on my hands it showed the warm colour, with darker tips. 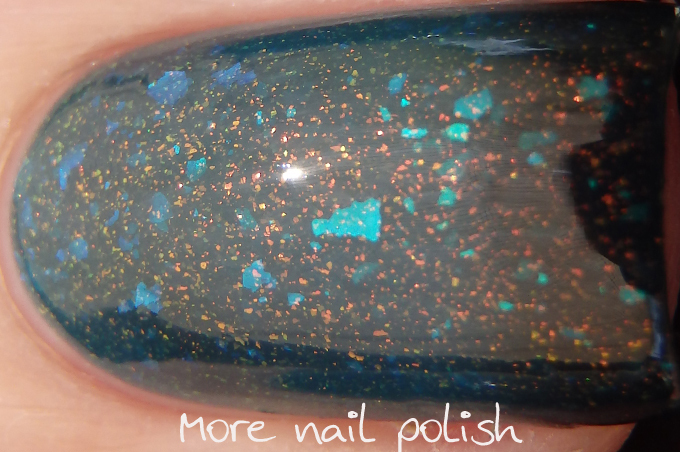 Sub Zero - the warm colour is a teal blue jelly and the polish has blue to green colour shifting flakies as well as red to green colour shifting shimmer. 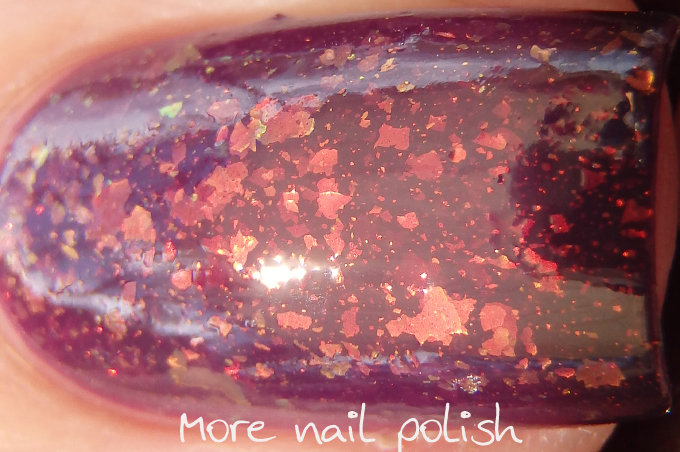 The shimmer is heavier in this polish compared to Rain, and the flakie ratio is less. 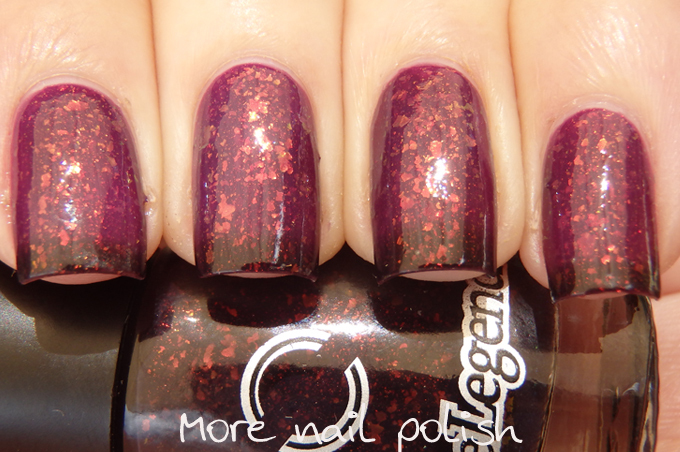 The cold colour is nearly black, but it looks almost dark maroon due to the red shimmer. 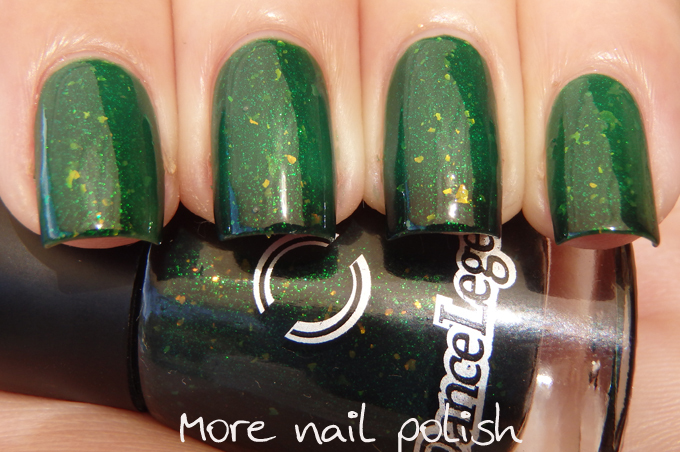 Reptile - This on is my favourtie, it's so gorgeous and if you love green polish like me, you will need this one. 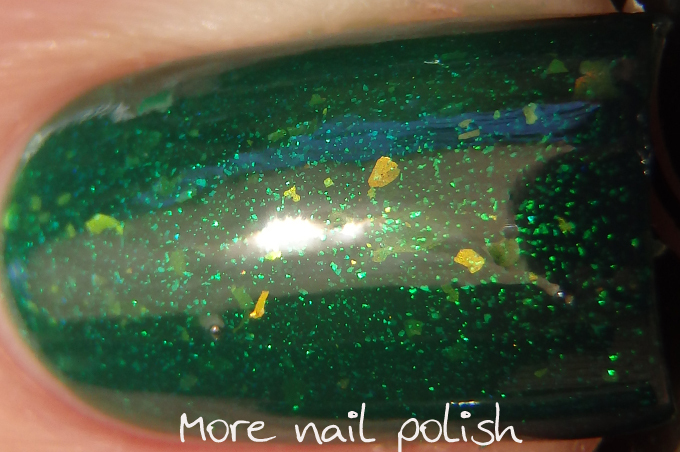 The warm colour is a bright green jelly with yellow to orange to green colour shifting flakies and a green to blue colour shifting shimmer. 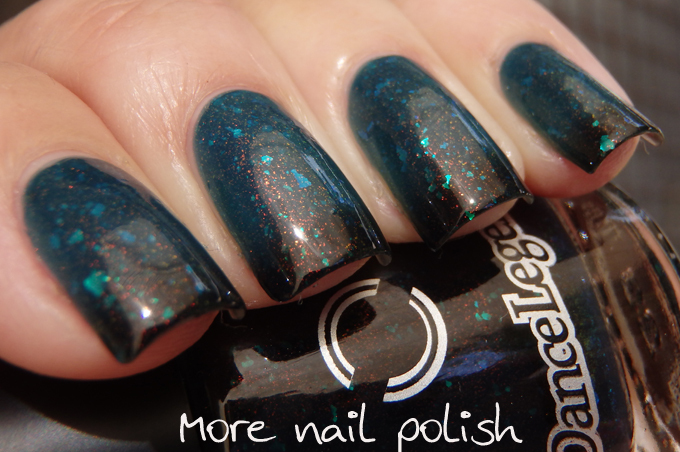 The flakie to shimmer ratio of this polish is like Sub Zero. 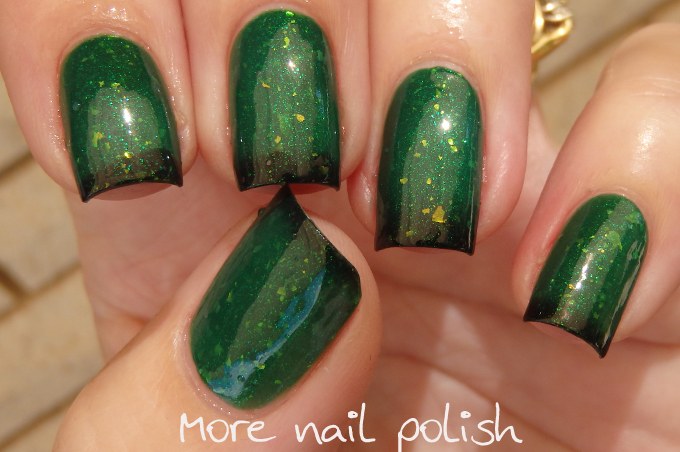 Most of the time my nails showed the warm colour, with dark blackened green tips. Want to see them in action? Here is an Instavideo of the colour change for all three. I received these polishes as part of a large shippment directly from Dance Legend at the beginning of the year. I contacted Dance Legend a few days about about the fact that their English store is closed, and it aparently has something to do with problems with the Russian post, and that they are having trouble with packages going missing. I really hope they are able to sort something out soon, as I was to order some polishes as a gift for someone. If anyone out there knows what the problems are with the Russian post, I'd love to hear from you. When the shop reopens for sales, you will be able to get them direct from Dance Legend. 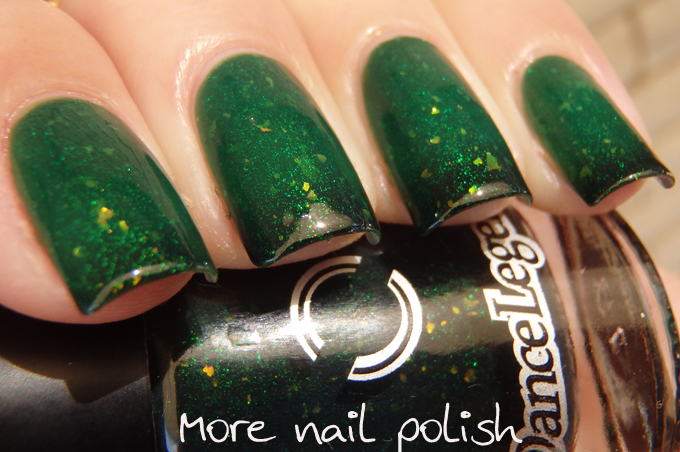 In the mean time, there are a bunch of resellers that you can get Dance Legend polishes from and I can see from my google searches that these are available from some now. Thermal flakies, now that is a concept I have not seen before. I need to have Subzero, it looks amazing! You're just used to getting your packages fast. I live in Moscow and if a package from Europe/the US/Canada/Aussie/Asia takes less than a month to reach me, I think the delivery incredibly quick. Your words surprised me, because, in fact, my experience lately has been that our post has started to work better, but maybe things are different for companies providing international shipping.